Alex Honnold in "Free Solo," from National Geographic Documentary Films. “Free Solo” isn’t just about mountain climbing without a rope. It’s about living with fear and pursuing dreams despite fear. “Free Solo” isn’t just about mountain climbing without a rope. Living with fear. Pursuing a dream despite fear. Conquering fear. Thus, though the sport that’s predominant in the film may be one that only a select portion of audience members can understand or relate to, the human condition that pervades the lives touched by that sport is universal. The film’s intimate examination of the feeling and its effects, when coupled with stunning photography and production design, create an unforgettable documentary experience. “Free Solo” follows Alex Honnold, a renowned veteran climber who has scaled mountains all over the world. Specifically, the film documents the run-up to Honnold tackling the most daunting challenge of his career. He resolves to “free solo” — climb alone without ropes or specialized gear — the sheer face of El Capitan at Yosemite National Park. As Honnold explains early on, free soloing “El Cap”, as it’s known, has been a lifelong dream. That said, the prospect also terrifies him, and that terror drives his meticulous, almost obsessive preparation for the challenge. But the climb itself actually takes up a relatively small portion of the film. Making up the balance is a look at Honnold himself. Over the course of the film, it becomes clear that Honnold is unique even among his peers. Soft-spoken, thoughtful, and quirky, he’s virtually the antithesis of a thrill-seeking daredevil in manner and bearing. But beneath his placid, almost stoic exterior burns a desire to constantly push limits. “Life is about performance,” he says at one point, and the film spends ample time showing how that belief touches every aspect of his existence. Coming as it does from National Geographic Films, “Free Solo” arrives with the implicit promise of breathtaking camera work. That level of quality in photography is just synonymous with the brand, and this film doesn’t disappoint in that regard. Credit directors Elizabeth Chai Vasarhelyi and Jimmy Chin (“Meru“) with delivering another documentary about climbing filled with jaw-dropping visuals. Audiences should find themselves thinking over and over again “How did they get that shot?” while watching their work here. It’s simply a marvel to behold. But of course, National Geographic documentaries aren’t just pretty travelogues. They’re about people, too, and how the filmmakers here tell Honnold’s story is arguably just as powerful as the film’s gorgeous vistas. It starts with their focus on Honnold himself. Their approach to their subject is as meticulous and methodical as Honnold himself is to the peaks he climbs, and it’s riveting stuff. But what’s most compelling on the personal side is how Honnold’s choices affect the people in his orbit. Fellow climbers he trains with, the woman who falls in love with him, even the filmmakers themselves all grapple with Honnold risking his life for his obsession. 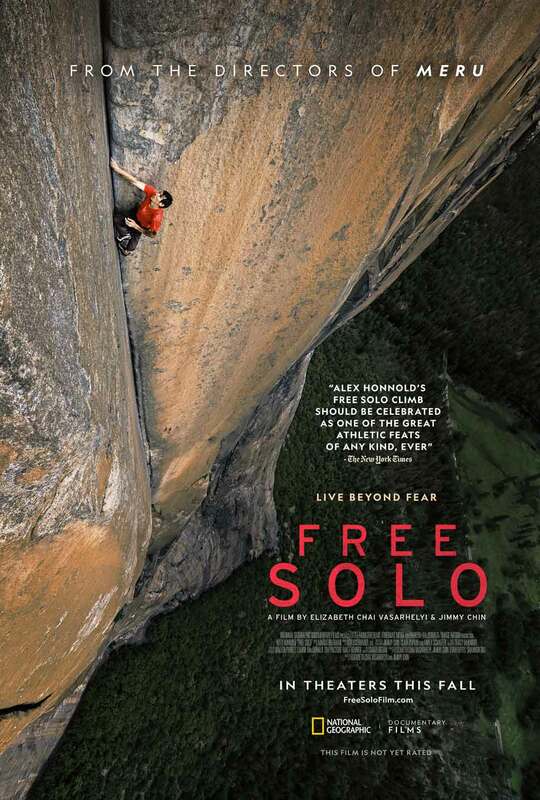 Indeed, the film touches upon just how many of Honnold’s peers have died free soloing. It’s something everyone in the film, Honnold included, is deeply aware of, how just one mistake could mean the end of everything. 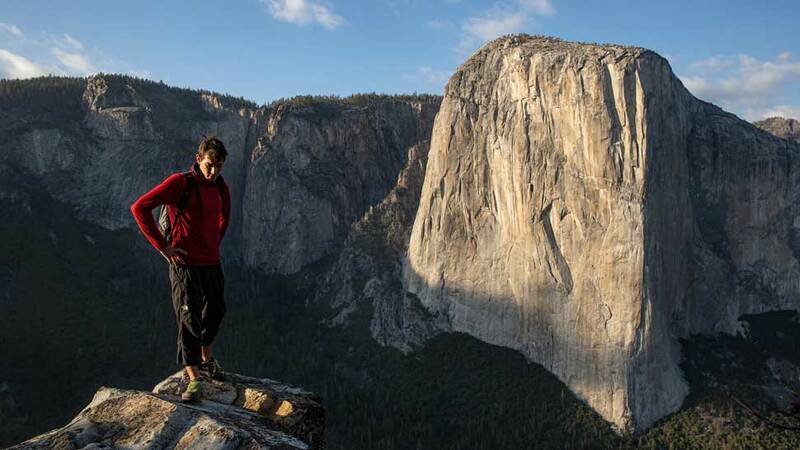 The film explores just what drives Honnold to press forward despite that awareness. Rest assured, it’s not bravado or stupidity at all. It’s something far more complicated and fascinating. Fans of documentaries and National Geographic films should see “Free Solo” in theaters at their earliest opportunity. Safe to say, due to the nature and setting of the film seeing it on the big screen is an absolute must. The only reason not to might be that you’re terrified of heights — if that’s the case, wait for it on home video. But if high places don’t scare you or you can manage the fear, make time to see this movie. It’s a captivating and ultimately inspiring journey, one that should leave audiences both thoughtful and exhilarated long after the credits roll. Directed by Elizabeth Chai Vasarhelyi and Jimmy Chin.